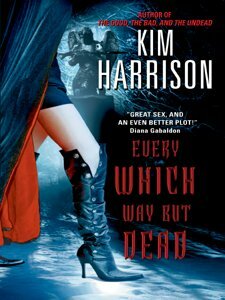 Finished reading Every Which Way But Dead (The Hollows, Book 3) by Kim Harrison. In this book Rachel Morgan strikes a deal with the devil. To get the demon, Algaliarept, to testify at the trial of vampire Piscary she agrees to be Algaliarept familiar and share her aura. Rachel is certain she can maintain control, because she can keeping her soul. As she changes places with the Algaliarept’s old familiar, Ceri, she takes pity on the girl and rescues her from the demon’s clutches. She learns that Algaliarept poses a greater danger than she first expected. Every Which Way But Dead is a good book, like the first two books in the series. In this book Harrison starts to write more about Rachel’s relationships and love life which I don’t find interesting and I feel that it distracts from the plot. Overall, Every Which Way But Dead is a fun book if you enjoyed the first two books.